It seems everyone pulls out the stops for Christmas, the second most important Christian holiday in Eastern Europe after Easter. Christmas is another opportunity to feast after a fasting period. In this case, Advent. But not only is feasting part of the festivities, visiting and entertaining hordes of friends and family are mandatory. And no Eastern European is welcomed into the home without a toast to one's health (whether with vodka or mulled wine or fruit cordials) and, at the very least, tea or coffee with sweets, if not a full-blown meal. Honey bread and gingerbreads are the overwhelming favorites among the countries, some highly decorated, but butter cookies with sprinkles are not unknown. Well, see for yourself, below. 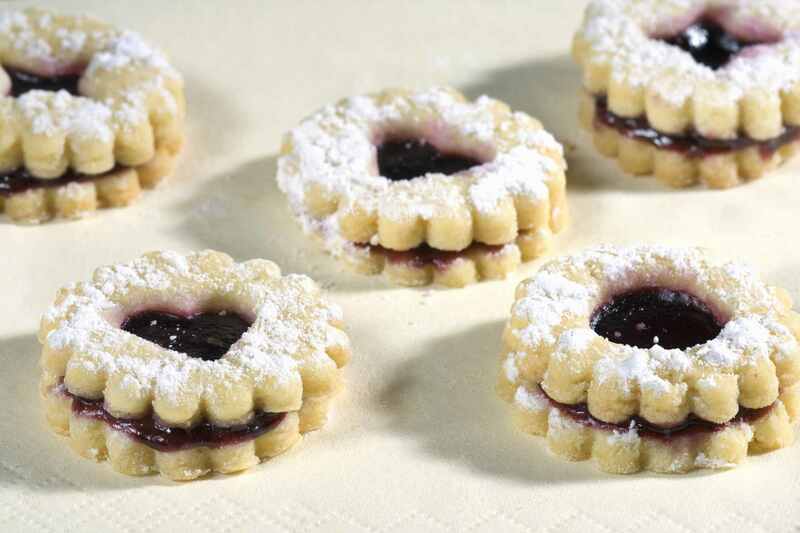 Bulgarian jam-filled cookies known as maslenki are popular for Christmas. They are traditionally made with lard, but butter will do. When rose-flavored Turkish delight or is chopped and mixed into the dough, they are known as lokumki. The dough for Bulgarian honey-spice cookies or medenki is typically rolled out and cut into fanciful shapes. When the dough is shaped into ovals or pushed into walnut-shaped molds and then sandwiched together with rosehip jam and dipped in melted chocolate and nuts, they become Bulgarian acorn cookies. Croatian honeybread cookies called licitars are often heart-shaped, but are also made into doll, bird, mushroom, horseshoe, wreath and horse shapes, among others. Croatian Fritters or Fritule and Croatian Angel Wings or Krostule are often served for major holidays like Christmas and Easter. Croatian Quince Candy or is another favorite at Christmas time. Prepared at the end of the growing season, the candy is made and stored with laurel leaves (bay leaves) until Christmas. And, because they are somewhat time-consuming to make, Croatian Peach cookies or Breskvice are saved for special occasions like holidays, weddings and christenings. St. Nicholas Day, Dec. 6, signals the beginning of Christmas baking for many Czechs. Out come all the time-honored recipes for both labor-intensive and easy no-bake cookies, and sweets known as vánoční cukrový (vah-NAWTCH-nee tsoo-KRAW-vee). This is an all-inclusive list that can consist of cookies, dainty tarts, candies and more. It conjures the image of sugar plums dancing in one's head. Hungarian Non Plus Ultra Cookies. © Barbara Rolek licensed to About.com, Inc.
Like Croatians, Hungarians favor intricately decorated honeybread or honey cookies, nuthorns known as kifli or roszke, kolacky similar to Polish kołaczki, shortbread cookies known as , and spice cookies to serve at Christmas. But Hungarian Non Plus Ultra Cookies, another one of those time-consuming cookies that is reserved for very special occasions, is one of the prettiest cookies and is considered an apro tea sűtemény or "tiny tea cake." Lithuanian Poppyseed Cookies or Aguonu Sausainiukai are popular year-round, but poppyseeds are especially important for Christmas Eve, Christmas and New Year's because all the little seeds symbolize fertility and wealth. Angel wings or ausukai like chruściki are popular, too. But probably the most popular is the grybai or mushroom-shaped spice cookie. They're a little labor intensive but a time-honored tradition. Polish Almond Cookies or Amaretti. © Barbara Rolek licensed to About.com, Inc. In Romania, the Christmas meal is sweetened with cozonac and Turkish delight known as rahat or lokum. As for cookies, Salam de Biscuiti, or unbaked cookies made to look like slices of salami, are popular at Christmas time. Many other Eastern Europeans make this treat. The most popular Russian Christmas cookies are pryaniki. These spice cookies originated in Tula, not far from Moscow. The elegant ones from Tula are stamped with a wooden press producing an embossed surface. The home variety is a thick, simple cookie with white frosting. Today, they are most often served with tea, but in days past, they were exchanged as tokens of love and respect at weddings, christenings and holidays. Commercially prepared pryaniki are made with sweet centers including condensed milk, chocolate and strawberries. Khrustiki, which are similar to Polish chruściki also known as faworki, and Croatian krostule, also are seen at holiday times. Balkan Nut Kifle. © Barbara Rolek licensed to About.com, Inc.
Serbians have a rich dessert history with tortes, nut rolls, strudels and more. As far as cookies go, kifle have to be the most popular for Christmas. Gingerbread St. Nicholas Cookies. © Barbara Rolek licensed to About.com, Inc.
Ukrainian Christmas Honey Cookies known as medianyky (which are similar to Bulgarian medenki) can be rolled out and cut into rounds, stars, crescents or other shapes and are often hung near the bottom of the Christmas tree as treats for the younger children who can't reach the higher branches. Honey cookies or sugar cookies are often cut with Byzantine bishop cookie cutters.